This pudding is bananas easy. Growing up, banana puddings were serious business in my house--there's definitely a right way and a wrong way. The pudding should never, ever come from a box. The pudding should not be a weird shade of yellow. Mix together sugar, flour and salt in top of a double boiler. 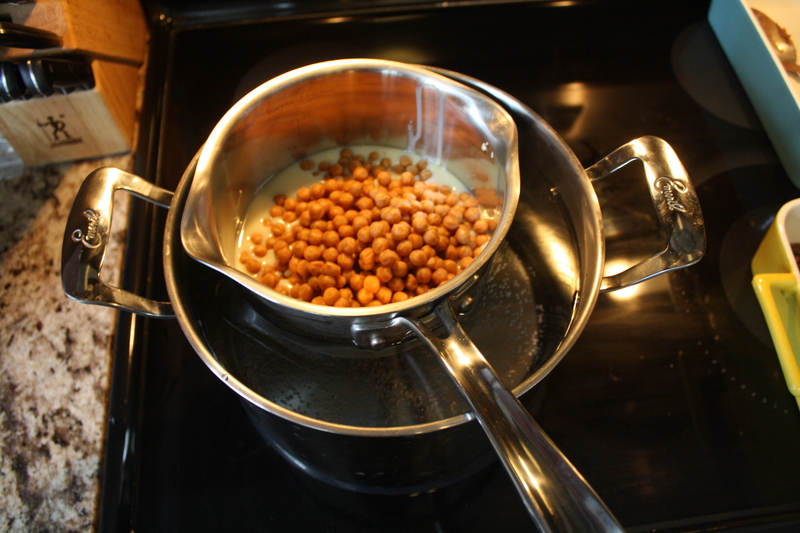 Don't have a double boiler, no worries. Just use two sauce pans or a pan and metal bowl. Just make sure not to fill the bottom pan with too much water...you don't want boiling water to find its way into your pudding. Stir in egg yolks and mix. Cook over double boiler for 10-15 minutes until thickened. Stir constantly! Once thick, remove from heat and stir in vanilla. To assemble, spread small amount of pudding on the bottom of a baking dish (1 1/2 quart dish is best, but a 9x13 glass baking dish works too). Cover with 1/3 of the bananas, 1/3 of the wafers, and top with 1/3 of the remaining pudding. Repeat x2. Top with meringue (recipe here). Bake 15-20 minutes, or until the peaks on your meringue are golden brown. Best served warm, but also really good cold. SHARE with a banana lover!